Writer/director Jordan Peele follows up his sensationally well-received Get Out with Us, the story of a vacationing family who are attacked by doppelgängers — four, strange characters who look just like them. What begins as a mysterious home invasion thriller becomes a revenge movie, and then it goes in other places that one dares not discuss for fear of spoilers. Lupita Nyong’o (Oscar winner for 12 Years a Slave) is the headlining actor here, playing both the family matriarch and her shadowy ‘other’. She’s terrific in the role, especially when she moves and speaks as the doppelgänger. Winston Duke, Shahadi Wright Joseph, and Evan Alex also do fine jobs in their dual roles. Young Alex especially impressed me with his feral, dog-like doppelgänger performance. I have one major problem with Us, but the good definitely outweighs the less good. 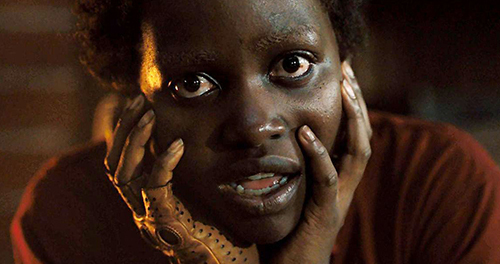 Jordan Peele shows us once again that he has great talent for directing genre films. In Us, he creates atmosphere, builds suspense and tension, and helps his cast achieve some moments of compelling performance. He’s also got an almost Spielbergian instinct for creating iconic imagery. In Get Out, we’ll never forget the image of Daniel Kaluuya falling into the abyss of ‘the sunken place’. 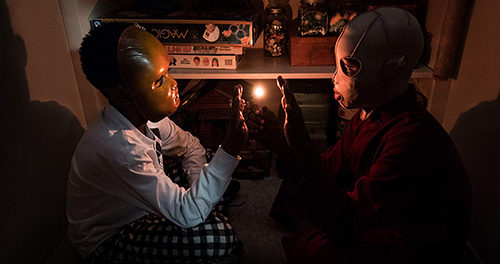 From Us, I’ll never forget the image of two young boys wearing masks and playing with fire in a darkened closet (probably my favorite scene in the film). Or Nyong’o wielding a fire poker while creeping down a corridor full of rabbits. I also thoroughly enjoyed composer Michael Abels’ contribution to the film. His percussion, choir, and strings give the film tribal and ethereal flavors, and provide striking editorial structure for some of Peele’s most visceral sequences — most memorably in a climactic battle between Nyongo’s two characters. My problem with Us is a problem common in contemporary horror films. It explains too much. Peele sets up a mysterious premise, and for as long as we are left in the dark about who the doppelgangers are, or where they came from, Us works really well. Not knowing things is scary! Fairly early in the film, we get a rudimentary, somewhat vague explanation for the doppelgängers’ existence. That was enough for me. But in the third act, Peele goes further — too far. Once he gets specific about the background and nature of the characters, my suspension of disbelief was strained to the snapping point. And then Peele employs a Shyamalan-esque coda that I’m convinced makes no sense at all. What confuses me about these decisions is that the film truly doesn’t need the explanation or the twist. It would resonate as discussion-worthy social commentary no less — and perhaps even more — without explaining everything away. While my problem with Us is a significant one, I still really enjoyed the film overall, especially before the final act. It works as a very entertaining genre film, but it’s also a movie ripe for analysis and discussion. And that’s a quality I value more than perfection.